Thought Visa Wellington On a Plate couldn't get any juicier? Think again. Celebrating a decade of the annual Burger Wellington competition, Visa Wellington On a Plate are now set to release a cookbook, collating the tastiest efforts from some of the city’s favourite eateries. This hotly contested and much-loved burger battle takes place in conjunction with Wellington on a Plate in August every year, attracting hundreds of entries and thousands of hungry punters. Burger-lovers can now recreate their favourites at home, with recipes from past winners and finalists spanning 10 years. Edited by Wellington’s Lucy Corry, the book features recipes from the conventional to the wildly creative, including Apache’s winning Bang Bang Burger, Egmont St Eatery’s Fillet O’ Cray Burger and last year’s reigning champion, the Kiwi China, China Kiwi Burger from Mr Go’s. Now in its 10th year, this year's instalment is set to be bigger, tastier and more tantalising than ever, with more than 140 unique events and a whole host of foodie offerings running across 17 decadent days. 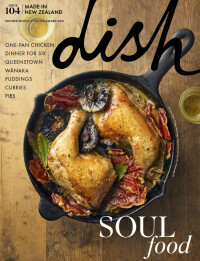 To learn more about our Dish staff picks, see here. Burger Wellington: The Cookbook will be available from August 1st. To learn more or to secure your copy, visit their website here.